October was a difficult month for investors, with the S&P 500 down sharply and now trading slightly negative in the 2018 fiscal year. A change from recent market action, October’s sell-off was the largest month-over-month decline since August of 2011. Understandably, many clients are concerned with the direction that markets are heading and what might be coming next. Regardless of what the market brings, your team at Barry is here to support your financial goals, both short and long-term. 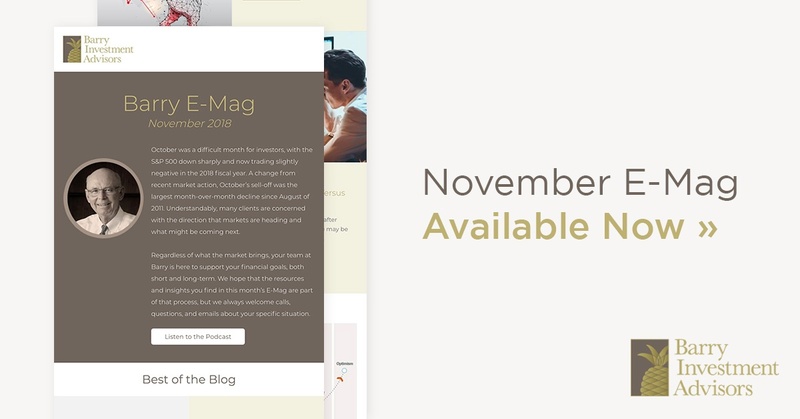 We hope that the resources and insights you find in this month’s E-Mag are part of that process, but we always welcome calls, questions, and emails about your specific situation.